bartlett mitchell sponsor over 30 beehives and inspired by this and combined with my natural curiosity I spent an evening beekeeping with Oli Chadwick of Farnham Honey. 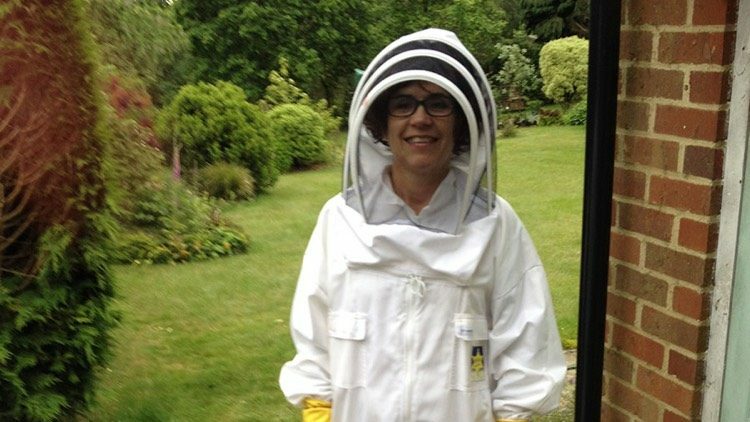 The first step was to put on my white beekeeping suit, I was told to bring my own marigolds and a set of elastic bands. Oli reassured me that there was no reason to fear the thousands of bees who were about to buzz around us. During the evening, hardly any bees bothered us and even when they did, Oli told me to remain very still and not to swipe them off me. I discovered that beekeeping is a year round job and Oli had many areas he had to be expert at; doctor, strategist, restaurateur, builder and fertility expert! During the Springtime Oli was busy making new frames for the combs but during the winter the main job is to make sure there’s enough sugar (nectar) to keep the bees alive until there’s enough natural nectar in the wild that they can forage for themselves. Oli explained that bees are quite like penguins; during the winter they form a group and flap their wings around the queen bee to keep her at 92 degrees. From spring to early summer the bees collect nectar and bring it back to the hive. I was struck by the fragility of the hive, the queen bee needs to be looked after and stay healthy so that she lays enough eggs to make bees that in turn gather nectar. Oli had recently ordered a new queen bee by post and we checked that she was settling in well to the hive. There was a ‘sticky’ moment (pun fully intended) when she slipped out of our hands on to the ground; we had to be so careful not to tread on her. Luckily she returned to the hive later that day. My main role as chief beekeeping assistant was to be in charge of the smoker. The smoke masked alarm pheromones released by guard bees during our inspection. The smoke created an opportunity for us to open the beehive while the colony’s defensive response was inhibited. Apparently the smoke also makes the bees feed a lot in anticipation of potentially having to abandon the hive because it may be on fire. This is also a distraction/decoy. Oli kept very detailed drawings showing the activity, rough numbers and geography of his 5 hives. He spent a lot of time telling me about the illnesses, viruses, fungi or parasitic mites that can attack the bees, which made me, appreciate them even more. My evening bee keeping with Oli was awesome and I am glad bartlett mitchell support the British Keepers Association. It is estimated that one third of the food that we consume each day relies on pollination mainly by bees. PS I didn’t get stung!